Our client first saw the painting while flipping through Christie’s Auction Catalog in December 2006. He said he had never seen anything like it. 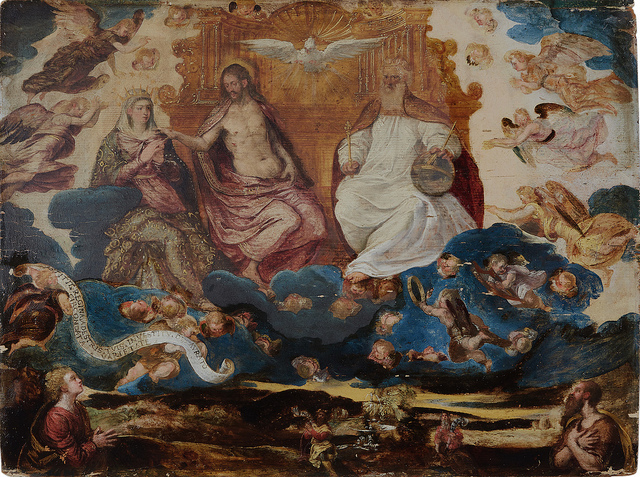 Though the painting was attributed to de Vos, it reminded our client of one of his favorite artists, Jacopo Tintoretto, due to the darkness of the composition and the stark variations in value. Interestingly, according to Flemish painter and art historian, Karel van Mander, de Vos had visited Venice and Rome and is thought to have studied with Tintoretto. During treatment, testing for varnish removal. Before treatment UV photo showing heavy varnish layer. Once the painting was bought and brought home, our client was able to examine the work more closely. He noticed that the painting, which was executed on a wood panel, was badly warped. Additionally, the work came unframed, which proved to be a great challenge to him. He purchased a frame, but wasn’t happy with it. Something was missing. The previous frame of the painting. Detail of donor kneeling in the lower left corner, before treatment. Detail of donor kneeling in the lower right corner, before treatment. Our client realized that the painting didn’t have the same vividness it originally had. He predicted that the whites of the robes and banner had lost their brightness over time, and that the painting needed to be cleaned to bring out the contrast he knew was there. Having worked with us before, he sent the painting to us, hoping we could unveil the original palette. During treatment UV photo showing partial varnish removal. Detail depicting the large crack at the top right of the painting. Detail showing visible wood grain. After initial photography and documentation, the painting was taken out of its frame to be examined. Our conservators noted that the painting was created with thinly painted oil on a solid wood panel. The oil paint appeared to have become even more translucent over the years revealing the horizontal grain of the panel on the front of the painting. The panel had undergone many forms of damage and treatment through the years. There was evidence that the panel had once been nailed and glued at the corners, and there was a long crack in the lower right corner. Additionally, the panel was convexly warped and had evidence of old insect damage. Detail depicting areas of paint loss. Unfortunately, the wood panel was not the only part of the painting that showed damage and previous treatment campaigns. The paint layer was flaking throughout the work, especially in a 5-inch wide section in the center of the composition. Our conservators also noted areas of previous repaint over the majority of the painting. The repaint was particularly heavy in the clouds and landscape around the figures and along the edges. The repaint had aged, and no longer matched the rest of the painting. There was a thin layer of natural satin varnish on the work, which had also discolored. Underneath the satin varnish also appeared to be remnants of an older varnish and a layer of embedded surface grime. 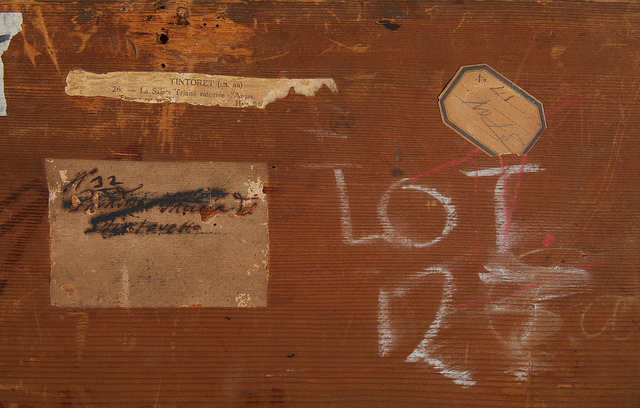 On the back of the painting, there were various inscriptions and labels, giving a small glimpse into the painting’s history. During treatment, after complete varnish removal. Our client did, however, elect to place the painting in a new frame, which he let his daughter pick out. She chose a beautiful gold leaf frame, with minimal detail so as not to distract from the work itself. Our Custom Framing and Fabrication Department customized the shape of the frame’s rabbet (the inner lip of the frame) in order to support the curvature of the warped panel. They also used flexible spring clips on the back, which eases the pressure on the panel, and attached an acid-free Coroplast backing board to provide additional protection. On the backing board, they attached encapsulated photos of areas of the back of the painting that had any writing or notation. He regularly finds himself staring at the work lost in thought. He hopes that it will stay in his family for generations to come.